A parasitic mite and unfavourable weather have caused a drop in honey production in Guernsey, the island's beekeepers association has said. Honey bees have been affected by the Varroa mite and the cold weather and strong winds at the start of 2013. 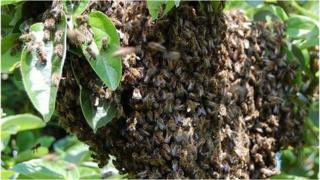 The Guernsey Beekeepers Association said some keepers had seen a 50% drop in honey production. Scientists said in recent years the mite had helped a virus wipe out billions of honeybees around the world. Association chairman Chris Tomlins said: "Most beekeepers would tell you their honey yield might be down by as much as 50% and some beekeepers might not have retrieved any honey at all. "Varroa continues to be a problem and various chemicals have been used to control it and we're reasonably successful... but they're weakening the colonies." However, Mr Tomlins added it was thought that the mite had not yet been recorded in Alderney.